Becoming a Financial Planner | Life Insurance and Annuity Producer | What is a Financial Planner? | What does a Financial Planner do? The unprecedented growth in the number of high net worth individuals and families was recently illustrated by the 2011 Deloitte Analysis and Oxford Economics report, which revealed that 1.5 million American households have amassed net worth’s of $1 million dollars or more in the past three years alone. A projected 10.1 million more are expected to achieve this benchmark in the next decade. The Certified Financial Planner Board of Standards published the results of a recent survey of America’s middle-income households showing that nearly a third have retained financial planners to help them rebuild after having suffered losses to their 401(k) plans during the financial meltdown of 2008. America’s middle-income families and new millionaires have more in common than might be immediately apparent. Both are turning to well educated and experienced financial professionals to help them hold on to what they have earned through responsible tax planning and savings practices, while also looking to grow assets through wise investment strategies. This is reflected in the 30% growth the U.S. Department of Labor expects to see in the personal financial planning industry during the current decade. America’s Financial planners are licensed registered investment advisers, securities sales reps, life insurance producers, CPAs, as well as other experienced financial professionals who have attained elective professional certification independent of these licenses. The career paths are different, but they all converge on a common professional agenda aimed at helping America’s families and business owners achieve their financial goals. Although some 70% of investment advisors work for investment advisory firms, there’s a growing trend that shows more individuals and families turning to independent investment advisors than ever before. A study conducted by the research firm, Cerulli Associates, showed that assets under the management of independent advisers tripled to a total of $1.7 trillion during the ten-year period ending 2010. This is in addition to the $13 trillion currently being managed by salaried employees of major investment firms, as was reported by the Investment Company Institute in 2010. Most states require investment advisers and investment adviser representatives to pass the North American Securities Administrators Association’s (NASAA’s) Series 65 Uniform Investment Adviser Law Examination. Some states will accept a combination of the Series 66 Uniform Combined State Law Exam and the Series 7 General Securities Representative Exam in place of the Series 65. Financial planners who opt to take the Series 66 and Series 7 combination must pass Series 7 before taking Series 66 and will require firm sponsorship to take the Series 7. This is the exam scenario most commonly pursued by securities representatives interested in expanding their role to include investment advisory services. Prospective investment advisers should check with their state’s Securities Commission for specific guidelines. Links to securities divisions for all states can be found here. In order to take any of the examinations, the investment advisory firm for which an adviser works must file a Form U-4, Uniform Application for Securities Registration or Transfer on the adviser’s behalf. The firm’s compliance department should be able to assist advisers in completing this form and submitting it through the Investment Advisor Registration Depository (IARD). Most states will give advisers 120 days to take the exams from the time of registering for them. They are offered at a variety of testing centers, including Prometric and Pearson VUE, across the country. Some states will waive the examination requirement if a prospective investment adviser holds one or more of the following professional designations: Chartered Investment Counselor (CIC), Chartered Financial Analyst (CFA), Certified Financial Planner (CFP), Personal Financial Specialist (PFS), Chartered Financial Consultant (ChFC), or Chartered Life Underwriter (CLU). Investment adviser firms must register at the state level with their state’s Securities Commission if managing client assets that total less than $100 million, or at the federal level with the Securities and Exchange Commission (SEC) if managing client assets in excess of $100 million. In both cases this is accomplished by filing Form ADV through the FINRA-managed Investment Adviser Registration Depository (IARD). Investment adviser representatives become registered when their employing firm files Form U-4 with the state Securities Commissions or the SEC, and after they’ve passed the necessary examinations. Included within the registration process is mandatory fingerprinting and a criminal background check. While there is no set experience prerequisite in order to become an investment adviser, most firms will require on-the-job training for new advisers. This could involve job shadowing a fellow adviser or learning in a group training setting. The duration of on-the-job training varies from one company to the next, and could last from a few days to a few weeks. After passing necessary examinations, investment advisers and investment adviser representatives may work for multi-national, national, and regional investment advisory firms located across the United States. Some of the most recognizable names of these types of firms include Edward Jones, Morgan Stanley Smith Barney, and UBS Financial Services. Many investment advisors may choose to license their own investment advisory firms through their state’s Securities Division. Stockbrokers, also known as broker-dealer agents, work for brokerage firms selling securities and other investment products. Some stockbrokers only work with clients with a very high net worth, while others serve clients at various stages of financial growth. Stock transactions place trillions of dollars in the hands of America’s stockbrokers each day, operating from brick-and-mortar firms or online through discount brokerage firms. Along with earning a client’s trust, being a good salesperson is key to success as a stockbroker. Stockbrokers may be employed by internationally recognized brokerage houses, national brokerage firms, or local brokerages. Some of the most recognizable names among brokerages include Scottrade, Merrill Lynch, and Charles Schwab. Brokerage firms are required to file Form U-4, Uniform Application for Securities Registration or Transfer through the FINRA-managed Central Registration Depository (CRD) system for each of their sponsored registered reps. This serves as an application for the Series 7, General Securities Representative Examination, which is required for a general securities license. Some firms may require registered reps to take other product exams for specific exchanges, as in the case of those dealing exclusively or primarily in commodities. State licensing as a registered representative most often requires taking one of the state law exams, the Series 63, Uniform Securities Agent State Law Examination or the Series 66, Uniform Combined State Law Examination. This should be verified through each state’s Securities Commission. State law exams, when required, must be taken after passing one of the securities products exams, and are always taken in combination. Once registered, stockbrokers have 120 days to take the exams, which are administered at Prometric and Pearson VUE testing centers across the nation. Stockbrokers are registered with a self-regulatory organization like FINRA, as well as with their state’s Securities Commission. Filing the Form U-4 through the Central Registration Depository initiates this process. Brokerage firms will usually pay all registration fees and examination fees incurred during registration. All prospective stockbrokers must also undergo fingerprinting and a criminal background check prior to licensure. Stockbrokers in all states must fulfill continuing education requirements in order to maintain Series 7 licensure. FINRA sets forth this mandatory continuing education, which includes a Regulatory Element and a Firm Element, to be taken biennially after registration and triennially after the first biennial period. This continuing education is designed to keep stockbrokers updated on the current trends in the market, new securities products available, and new or updated regulations pertaining to securities products and sales procedures. 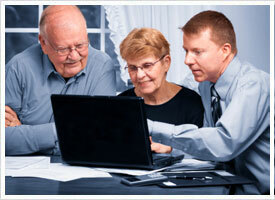 Life insurance is a key component to any well-rounded financial plan. Life insurance producers also offer annuity products, which have proven to be some of the most popular and dependable financial products available. Insurance producers who offer financial planning services are well known for going independent and establishing practices of their own. However, many work for major insurance firms including John Hancock, Pacific Life Insurance Company, AXA Equitable Life Insurance Company, and Allstate Financial. A degree in accounting or finance would be very beneficial to anybody interested in becoming a life insurance and annuity producer. It would be wise to include courses in personal finance, insurance law, risk management, as well as fixed and variable products. Degrees specific to insurance and risk management are also widely available. Most states require life insurance and annuity producers to take pre-licensing education courses of varying length prior to passing the state’s Life Insurance Producer examination and registering with the state’s Insurance Division. Prospective life insurance producers are urged to check with their state’s Insurance Division to determine specific pre-licensing requirements. Each insurance department sets its own mandates on required pre-licensing education, including number of credits necessary, approved providers, and length of time given to complete the education prior to taking the state insurance licensing exam. Most states that do require pre-licensing education require that a certain number of credits obtained be specific to ethics courses. Life Insurance producer licensing examinations are handled through each state’s Insurance Division. Many states use third party testing centers such as Prometric and Pearson VUE to administer these exams. Scheduling of tests is usually done through registering online with the testing centers, which are located in cities all across the country. Certain professionals may be exempt in some states from taking pre-licensing education and/or the life insurance licensing examination. This varies from state to state, but usually those holding the following professional designations receive some sort of exemption: CLU (Chartered Life Underwriter), CIC (Certified Insurance Counselor), or a person who is licensed as a Life and/or Annuity Producer in another state. Some states allow registration for an insurance producer’s license at the testing center, or incorporate registration into the examination process. Prospective insurance producers must also be fingerprinted and undergo criminal background checks. Depending upon the state, licensing applications and fees may be submitted online or via postal mail. Producers who wish to sell variable annuities must be licensed as securities professionals through their state’s Securities Division. This involves passing the Series 6 Investment Company Products/Variable Contracts Limited Representative Exam or the more comprehensive Series 7 General Securities Representative Exam. Once licensed, life insurance and annuity producers must fulfill continuing education (CE) mandates specific to the state in which they sell life insurance and annuities. Each state’s Insurance Department determines the number of credits necessary, and the providers authorized to provide CE. For variable product producers, continuing education requirements of both FINRA and of the state Insurance Division must be fulfilled to maintain licensure. Certified public accountants very often expand the scope of their practices by offering financial planning services, and are uniquely qualified to do so given their existing client base and familiarity with their clients’ personal finances. Many CPAs work for companies that offer a broad spectrum of professional and financial services, including public accountancy and financial planning. A CPA’s value increases with training in finance and by achieving specialized designations such as the Personal Financial Specialist (PFS) offered by the American Institute of Public Accountants (AICPA). Some of the major public accounting firms employing CPAs as financial planners include Deloitte & Touche, Ernst and Young, Grant Thornton and KPMG. Aspiring CPAs must fulfill educational requirements determined by their state’s Board of Accountancy, the specifics of which vary from one state to the next. A link to all state boards of accountancy can be found at the AICPA (American Institute of CPAs) website. Although credit distribution among specific courses differ between states, under the Uniform Accountancy Act, all CPA candidates must have a minimum of 150 semester hours of post-secondary education and a bachelor’s degree. In addition to passing the Uniform CPA Exam, all states require that aspiring CPAs complete a minimum of one year of accounting work experience before licensure. Specifics of that experience, such as the type of work setting, amount of experience, and duties that must be fulfilled, differ from state to state. Check each state board of accountancy’s website for further details. The majority of states also require that prospective CPAs fulfill an ethics requirement, which may involve taking a national course in ethics, such as one provided by AICPA, or a state-specific examination pertaining to state ethics and laws in accountancy. All prospective CPAs must pass the Uniform CPA Exam prior to state licensure. This is the fundamental licensing exam required to become a CPA. States administer the Uniform CPA Exam through the National State Boards of Accountancy (NASBA), which processes registration and helps facilitate the licensing process for all states. Certified public accountants must be licensed in each state in which they practice. Filing of an application for certification with the respective State Board of Accountancy is necessary prior to certification/licensure in that state. The information that must be included on this application details education (through college transcripts), experience (signed and verified by an employer), Uniform CPA Exam scores, and scores from an ethics exam, as required. Once the state board of accountancy receives and reviews an application, certification is usually granted within a few weeks. Once licensed, CPAs must fulfill continuing education (CE) requirements as determined by their state in order to maintain licensure. Each state board of accountancy sets forth CE requirements, including credits needed, types of courses that must be taken, and authorized providers of CE courses. Some CPAs also opt to pursue further certifications or professional designations in order to broaden their financial planning knowledge and prospects. These may be specific to personal financial planning, retirement planning, estate planning, or working with other types of investment products and clientele.